From time to time I perform the backup of my Macbook Pro using Carbon Copy Cloner. This nice app mirrors the whole drive and I use it since I've switched the HDD to SSD with the same capacity (the free HDD is now using as backup storage). In case of needs, I can boot from external drive with all my files and system ready to use. For Windows I recommend Acronis True Image with the similar functionality. But to be honest, I do not perform this backup regularly. Before I've bought my Synology NAS I wasn't a friend of Time Machine because with external drive it is useless. So I was in need of something which backup to the cloud and do it like 'set and forget' way. There is Mozy, I've used Norton 360 a years ago and the last year I got a tip to Backblaze Backup. 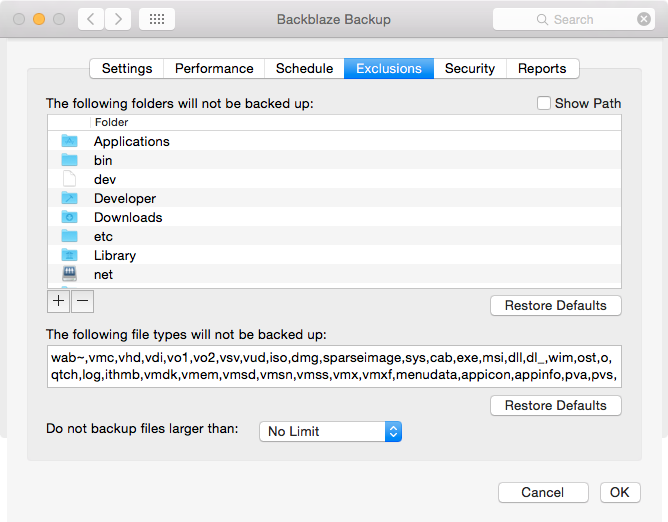 Backblaze Backup works in both Windows and OS X. As Macbook Pro user I use the OS X version. It installs as a new icon in System Preferences panel. The initial backups took a few days because it uploads a lot of your gigabytes to the internet cloud. You don't have to set up what will be uploaded. The Backblaze Backup do it itself. But do not think about it as Time Machine, it is not backing up all files. 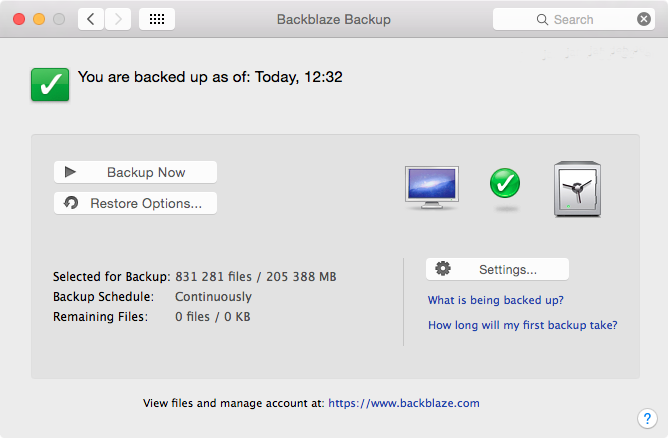 Backblaze Backup works with your working data - photos, archives, documents, videos etc. Fortunately you can set which folders should be ignored. The default settings ignores the Application folder for example. I've also put the Downloads folder as the first new item to ignore. For me, the initial backup with about 400 GB of different content took about two weeks. There was no limitation to work, my laptop was running for morning to evening. The Backblaze Backup work is not noticeable. The System Preferences panel will show you the link which will go to the website interface. There you can see how much time will take the current backup process. If you afraid about your network performance, you can set the manual throttle to limit the transfer speed of your backup. I recommend to set up the security key, so your data will be secured by the AES. 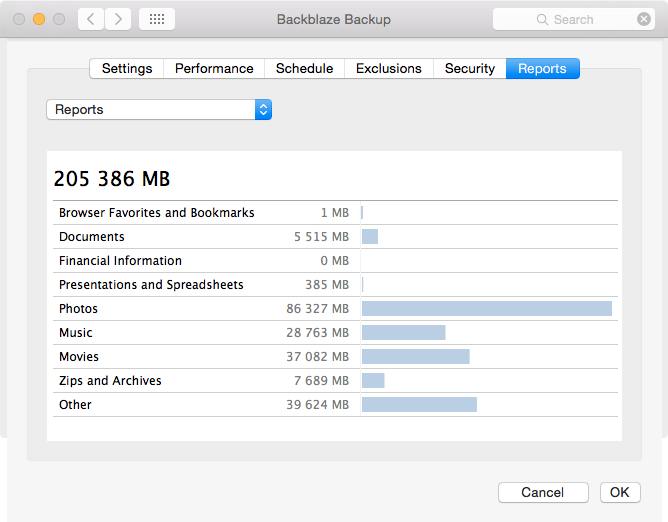 Backblaze Backup offers a few ways how to get your data back. The first, fast and easiest way is to use the browser. After logging in to the Backblaze website you will see the simple file explorer. 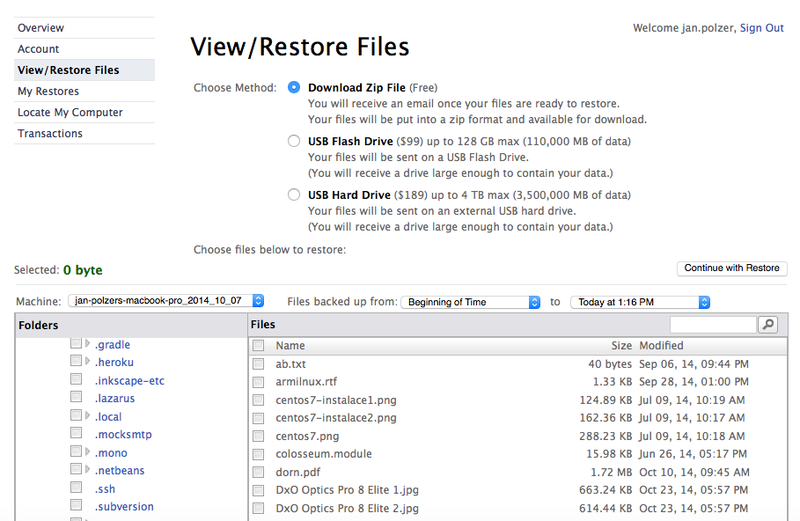 You can select what you need to recover and prepare a ZIP file to the download. As soon as your data is ready to download, you will be noticed by e-mail. The small data are ready just as soon as you ask for them. The transfer goes over the SSL, the ZIP file is not password protected. ZIP download is not the only option. If needed, Backblaze can send you the USB flash or external drive with your backup. I like the simplicity of Backblaze Backup. Just install and forget. The data are backed up continuosly and you don't need to remember on backup software. Yes, it is not the whole system backup as with Carbon Copy Cloner, but these two are great companions I think. The pricing starts on 5 USD per month or 50 USD per year, or 59 USD for two years. These prices apply for one computer. Backblaze can locate your computer (this feature can be disabled) and you have also mobile application for access your data available.